Here I’m providing a complete reference of all 6,585 public types and 15,248 members included in Silverlight 5 and/or WinRT and where they overlap. My hope is that this will serve as a reference to Silverlight developers trying to get up to speed with WinRT. Click here to see the WinRT Genome Project results. Note: Please let me know if you see an errors or have requests. I’ve only begun to comb over these results myself and will be looking for ways to improve it going forward. Enjoy! At MIX 2011 I had the fantastic opportunity to present on many of the cool new features recently added to the MMP Player Framework (formerly the Silverlight Media Framework). 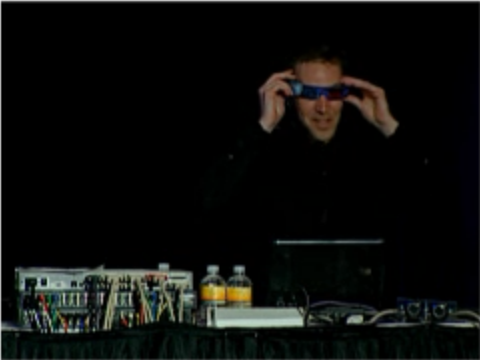 One of these new features is the ability to play stereoscopic 3D videos (think Avatar). 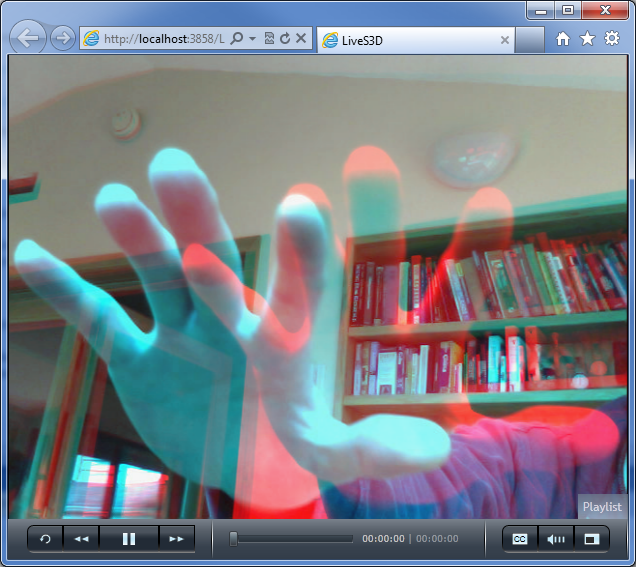 For fun, I also demoed a little app I built that allowed you to play LIVE stereoscopic 3D using 2 webcams. For those of you who want to try this at home, I created a new CodePlex project (liveS3d.codeplex.com) that contains all the required source code and a link to the app I demoed in my MIX session. 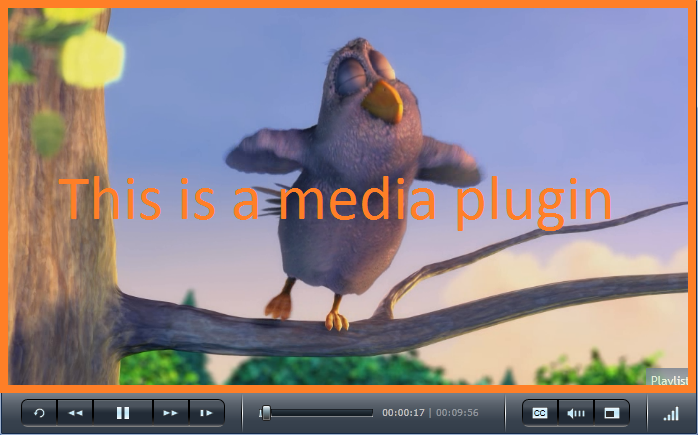 To understand how it works, first you need to learn a little about a special kind of plugin in MMP Player Framework called a media plugin. The Player Framework was built with extensibility in mind and many of its features are dynamically loaded as plugins. Even the rectangle used to play the actual video (as shown below) is a dynamically loaded plugin that you could replace with a custom implementation. Note: by default, the Player Framework ships with 2 media plugins: One for progressive video and another for smooth streaming. The most important part about showing a stereo 3D video is to make sure you have two source (one for the left eye and one for the right). To do this, I built another media plugin that served as a wrapper around two other media plugins. Internally it just created a Canvas control as it’s own VisualElement and then added and positioned the VisualElements from each of the child media plugins so they appeared side by side. Finally, I had everything I needed. I just needed to flip the switch! I was now ready to enable the new S3D feature in the Player Framework. This is super simple and all I had to do was add a reference to the new assembly: Microsoft.SilverlightMediaFramework.Plugins.Anaglyph3D and set the PlaylistItem.S3DProperties property. 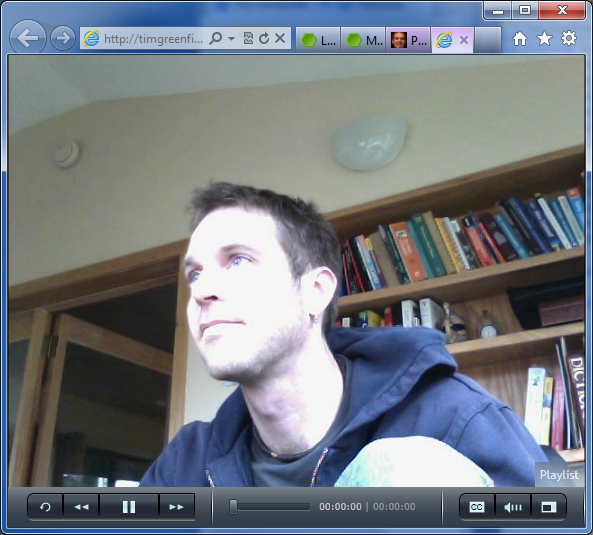 Note: You need to calibrate the angle of your webcams and get them just right. 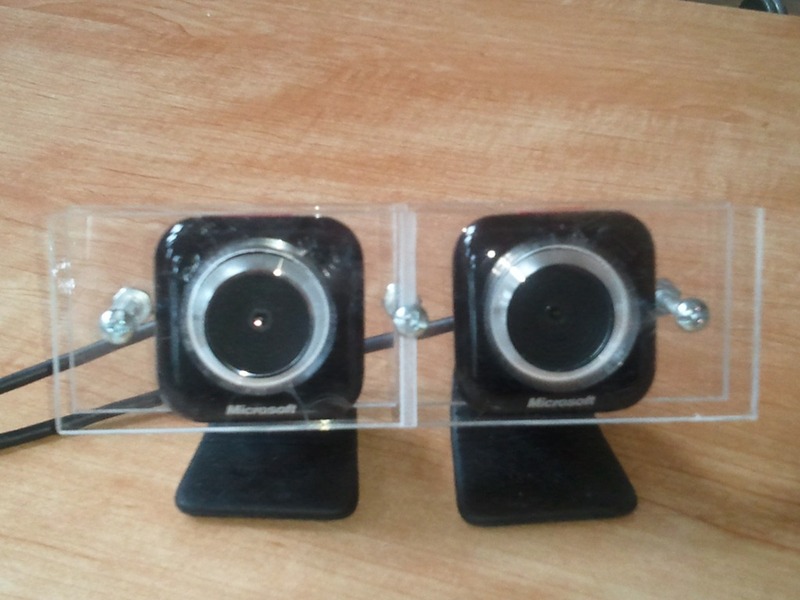 Ideally, the two webcams should both point straight ahead and not diverge or converge. 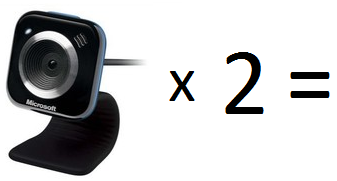 You can calibrate by making the red and cyan images align perfectly for objects very far away. 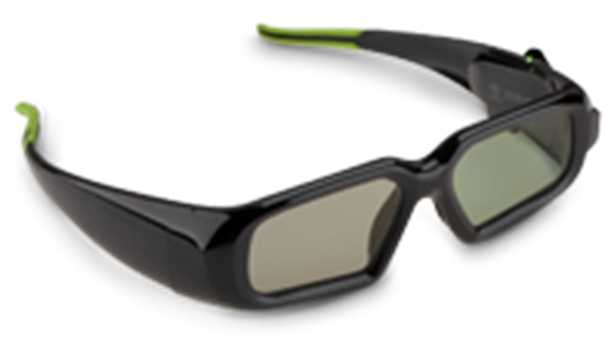 If you have the NVIDIA 3DVision Active Shutter glasses you can get an even better experience. To supoort this, remove the anaglyph plugin that comes with the Player Framework, and add a reference to the NVIDIA plugin available from the NVIDIA website. Awesome blog post by Bob Cowherd on how the new Player Framework S3D feature works. REQUIRED to compile source: Microsoft Media Platform Player Framework (formerly Silverlight Media Framework) v 2.5 or higher. There are a lot of reasons for developers to be excited about Windows Phone 7. First and foremost, .NET developers can easily build great apps using the language and tools they already know. If you’re like me, learning a new technology is always fun, but producing great results with minimal effort is better. But there’s another thing that developers and stakeholders alike should be excited about that goes beyond the benefit of the minimal learning curve: leveraging the Silverlight eco-system. Here’s a story, straight from the trenches, of the fantasic combination of code-reuse and redesign to maximize the benefits of the Silverlight ecosystem. In the summer of 2009 I created the award winning site: PuzzleTouch.com. The idea for PuzzleTouch was to take an existing and familiar concept (online jigsaw puzzles) and use Silverlight’s powerful runtime and graphics engine to create the world’s best online jigsaw puzzle app. Today, PuzzleTouch is a culmination of over a year of effort, refinement, and performance improvements. The decision to port PuzzleTouch to Windows Phone 7 was a no-brainer. First, as a Silverlight developer I already knew 95% of what I needed to know to build a WP7 app. But more importantly, I already had an established code base to start with. A little over a month ago, I sat down to see if I could get the main PuzzleTouch game play screen to run on WP7. Not to my surprise but much to my excitement, a couple hours later I was dragging puzzle pieces across the WP7 emulator and snapping them together! Here’s the significance: I’ve been dying to build a version of PuzzleTouch that ran on a phone since day 2. I’ve had many users ask if an iPhone version was in the works and for the past year I’ve been toying with the possibility of making the investment. The primary drawback was purely a matter of time… there was learning Objective C (or risking developing with MonoTouch), learning the new tools, and messing with my web services. And then there was still the question, would it even work? What if there was some insurmountable technical hurdle like no support for PolyBezier clipping or unusably poor performance. The learning process would be fun but let’s face it: my free time is precious. Have you ever heard the phrase: “It takes 80% of the time to complete the last 20% of the project”? While my initial port to WP7 was an enormous time-saver, there was a little more to it than adding a few new phone related features and dropping a few web specific features. I won’t get into the gory details on everything that needed changing but here’s a list of the major areas that needed attention from a technical perspective. Pixel shaders: Silverlight on Windows Phone 7 currently doesn’t not support pixel shaders. A big reason PuzzleTouch for the web looks so realistic has a lot to do with shadows and bevels. Fortunately, I was able to mimic dropshadows by adding a second semi-transparent puzzle piece behind the top one to get me one giant step closer to great looking puzzle pieces. *Screen shot from actual Windows Phone 7 app. Navigation: Had I used the Silverlight Navigation Framework on my website, this may have gone faster. 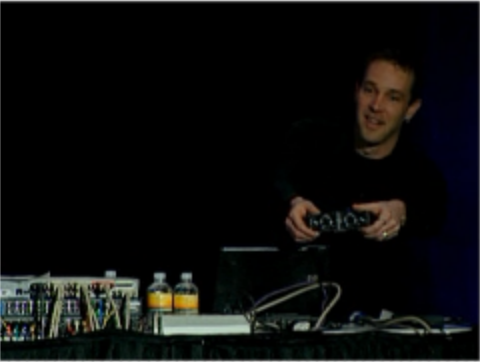 With WP7 you really need to think in terms of pages and be aware of passing around application state. Implementing support for navigation requied modest effort but overal wasn’t not too significant in the big picture. Tombstoning: Speaking of application state, it is important to understand that your app can be interrupted at any time by the user receiving and viewing a text message, hitting the search button, …etc. The app needs to be able to save its state when the user navigates away and restore it when they come back. This is not hard to do and there is a great API to help, but it is one you can’t overlook. Performance: The PuzzleTouch web version was already finely tuned to support up to 1000 piece puzzles. However, WP7 devices are even less powerful than a netbook and it was necessary for me to revisit performance from top to bottom. In the end hardware acceleration done right saved the day. AppBar: Another consideration was effectively using the WP7 AppBar. Real-estate: Last but certainly not least was the consideration of a much smaller screen. I had to move features to subsequent screens and really think hard about how to maximize the use of the screen to play something that normally requires a considerable amount of space. After all, when was the last time you played a jigsaw puzzle on anything but your dining room table? Just like how Silverlight vNext is expected to benefit from the work done on Silverlight for the Windows Phone (e.g. composition thread! ), web and desktop apps are likely to benefit from some of the dev and design improvements receiving spotlight from the phone today. I would speculate to say that the average Silverlight developer is more aware of hardware acceleration, frame-rate, multi-theading, and assembly load time performance now than they were before WP7. That is awesome! Silverlight is such a high performance runtime that it is easy to be lazy, but if as developers we learn more from the phone runtime and even make some minor changes to our coding styles, it will make for even better web and desktop apps. Performance: Much of the performance tuning I did for the WP7 version was applicable to my website. 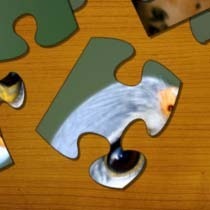 Refining my bitmap caching by using features like RenderAtScale now make PuzzleTouch.com run even smoother. Greater use of MVVM: One of the less mentioned benefits of MVVM is the ability to share view models with multiple views. In a single Silverlight web or desktop app it is not too common to have the need for two unique views for the same task, but when sharing code with your WP7 app, this becomes a clear win for using MVVM. Styling: In cases where I had built a custom control that could be reused, I still usually needed to style it differently for WP7. Partly to adhere to themes and partly to accommodate a smaller screen size. In these cases, I was able to simply template the control or expose new styling properties. Because of this, I now have more flexible and reusable controls in my PuzzleTouch namespace. Possibly the best part about being able to reuse code for the phone and the web is that they can become part of each other’s feature set. With PuzzleTouch, a user can use their phone’s camera to take a picture, turn it into a puzzle, and email it to their friends… who can click on that link and open that puzzle on the website. You might not immediatly see this as a feature of the phone app, but it is to the user. Depending on the app, being able to build an experience for the phone and the web can be invaluable combination. With Silverlight you have this potential and it’s not that hard. I urge those of you who are developing apps for the phone to not overlook this powerful potential. To conclude, much of what you develop today for the web and desktop can be reused on Windows Phone 7 and vice versa. But don’t be afraid to redesign the UX! Make your web apps shine on the web and your phone apps shine on the phone. The good news is that by using best practices and taking advantage of all the great things in the Silverlight tool chest (Xaml, MVVM, binding, assembly sharing, MEF, …etc. ), redesigning the UX while maintaining a common code base is just about as easy as it could be. Once Silverlight for WP7 and Silverlight for the Mac and PC sync up their versions (Silverlight 5!? ), it will be even easier. In the end, I was able to launch a v1.0 WP7 app in under two months in my ‘spare time’ that is arguably on par with to a v3.0 iPhone app. Plus, the website and the phone versions now compliment each other by extending each other’s feature set and I can enjoy the holidays without slaving away at my computer. It is a win for me, win for my users, and win for the platform. As an amateur photographer, I have always kept my eyes open for new tools to help me search, sort, filter, and view my own photos. Microsoft Pivot (a cool new technology that lets you easily view, search, and filter data using deep zoom) seemed like a natural and obvious fit for the task. Therefore, using Microsoft Pivot and the Pauthor open source libraries, I created a tool that helps users create a pivot collection from the photos on their hard drive and supports filtering by all the nifty meta data embedded in those files such as shutter speed, aperture, film speed, and focal length. 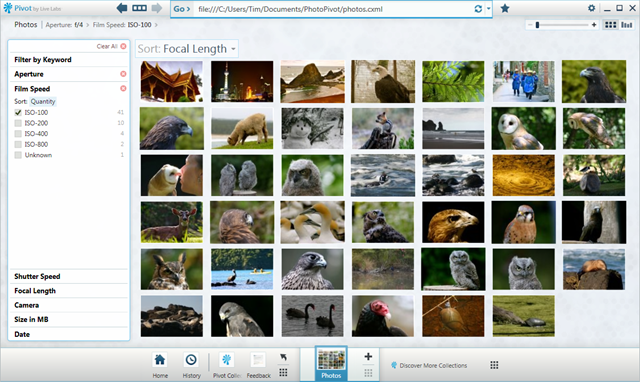 Plus, users end up with a great look set of deep zoom images from their photo collection! Step 2: Install PhotoPivot beta (I’m calling it a beta because I wrote it in about 8 hours). Browse for the location where you would like to dump the pivot collection and all the associated deep zoom files. Warning: If you run this on a couple hundred high resolution photos it will take ~5-10 minutes, if you run it on all 20,000 photos in your My Pictures folder… do it before you go to bed! The end result is awesome… especially when it’s your own photos that you’re filtering and deep zooming on. This collection is totally compatible with the Microsoft Silverlight PivotViewer control which makes it super easy to publish the result on the web. All you have to do is upload the output to a web server, toss a clientconfigpolicy.xml file in the domain’s root and build a 3 minute Silverlight PivotViewer app to view them. Read my earlier blog post for more details. The only down-side: if you thought it took a long time to generate the files, wait until you try to upload them; yikes! Source code is available. Knock yourself out! Microsoft Pivot. Seriously folks, this is where all the real work was done. DeepZoom. It wouldn’t be nearly as cool without it. Pauthor. And without this awesome open source library, I would never have bothered to build this. (It even uses parallel processing to generates all the deep zoom images). Great work guys! The new Silverlight PivotViewer control provides a cool and powerful way to visualize and filter data straight out of the box. If you have some data with a few dozen records or more and have images associated with each record, I urge you to give it a spin and build a quick Silverlight PivotViewer app to show off and enable users to search and filter that data. The whole affair won’t take you more than an hour or two and in the end you’ll have a great looking, fun and powerful window into our data. All you need to do is generate some special files that contain the data you want to show, create a Silverlight app that hosts the new Silverlight PivotViewer control, and point it at your data. Here is a proof of concept that I built using data from PuzzleTouch, my online jigsaw puzzles application, that shows off all the stock puzzles available and allows them to be filtered by category, popularity, and difficulty (based on user stats). Here I am creating a PivotCollection object to store my data. I tell it which fields I want to support filtering by (called a FacetCategory), and then I loop through my records and create a new PivotItem for each. Each PivotItem needs a name, href, and image, as well as a value for each FacetCategory. Once I’m done populating my PivotCollection object, I export it to the file system (which produces all the files required for the pivot control to function). There are other formats you can export to and from, but for my purposes I just wanted to generate from code and produce a local copy of the Pivot data all ready to go. Note: The coolest part here is that all the deep zoom images will be created automatically from the source images! No separate tools or typing in command lines are necessary! Please refer to the Pauthor documentation for more details on the Pauthor library. Step 2: Upload. Once you have the pivot data files created, upload them. I chose to upload my data to Amazon S3 because it is cheap and scalable but you could easily put it in any HTTP accessible location. Just remember to drop a clientaccesspolicy.xml file in the root of the domain if the data is hosted somewhere other than where you will be hosting your Silverlight app from. 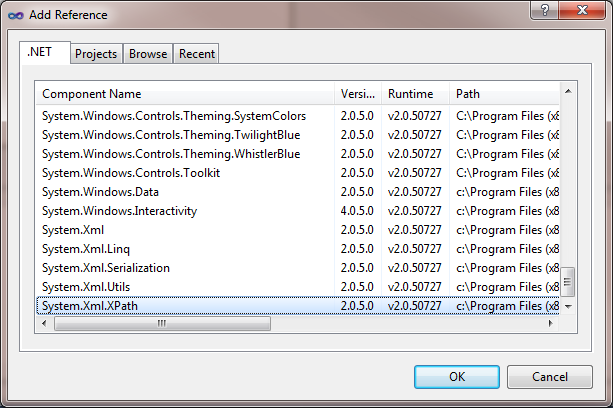 Download the Silverlight PivotViewer control. That’s it!!! You now have an application that can view your pivot data collection in all it’s glory. Deep zooming, filtering, searching…etc is all built in and working. From there, you can go forth and customize the experience all you want but with very little work you’ll have a fully functional Pivot viewing application that will give your users a lot of powerful abilities straight out of the box. And don’t worry, I haven’t forgotten about the padlock demo. I’ll be posting a follow up with explanation and full source soon. Silverlight 4 introduces XPath support including XPathNavigator and LINQ to XML extension methods for evaluating XPath expressions on your XElement objects! For those that aren’t familiar with XPath, it is essentially a big string that contains specially formatted text that is interpreted at runtime to describe a pattern for finding nodes in an XML document. You can use it to find nodes with specific conditions much like how regular expressions finds smaller strings in a bigger string. The downsides to using XPaths are 1) the string describing your XPath can get quite complicated and difficult to read, and 2) because the string must be interpreted at runtime, performance is worse than alternate methods. This is why I normally discourage using XPaths and probably why Microsoft shyed away from including XPath in earlier versions of Silverlight… thereby bolstering using the better practice of LINQ to XML for searching and parsing XML documents. However, XPaths (like regular expressions) have their place and at times come in very handy! How often do you just want to find out very simple information about an Xml file? Maybe you want to know how many nodes are in your document or how many have a certain attribute. Maybe you want to extract the text values from certain nodes so you can use them in another application. Maybe you want to paste all the values of a certain attribute into Excel so you can manually graph them. The possibilities are endless and if you ever have to work with Xml files (especially someone else’s), a tool to easily help without writing a program can be invaluable! Run the app. Note: You can also install Out of browser. 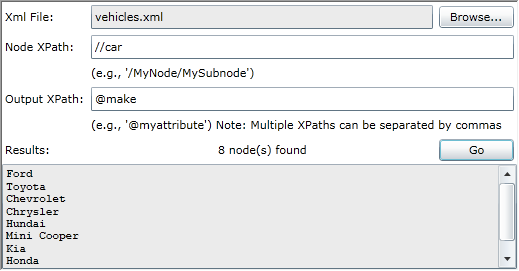 Type in another XPath in the Output field for what stuff in each of those nodes you want to display. Note: You can optionally enter a comma delimited list of XPaths in the output field if you want to get multiple things about each node found. Multiple results per node are separated by tabs so you can easily copy and paste the results into Excel and get different columns for each. XPathEvaluate returns a collection of XObjects. I simply take the first one and return its value to be displayed in the results window. To find out more about how XPathPad was written or to modify it to better fit your needs, download the source.